The Seattle-based Polar Star is the nation's only heavy icebreaker still able to operate. But the 43-year-old ship is already well beyond its expected 30-year service life. The Coast Guard crew of the Seattle-based Polar Star fought for nearly two hours to put out a Feb. 10 fire as the nation’s only heavy ice breaker traversed a remote stretch of water north of McMurdo Sound, Antarctica. The Coast Guard disclosed the incident Thursday in a statement that noted the damage was contained to an incinerator, several electrical systems and shipboard insulation. “It is always a serious matter whenever a shipboard fire breaks out at sea, and it’s even more concerning when that ship is in one of the most remote places on Earth,” said Vice Adm. Linda Fagan, commander of the U.S. Coast Guard’s Pacific Area. Senior Chief Petty Officer Nyx Cangemi, of Coast Guard public affairs, explained the delay, saying it took time to gain a full understanding of the fire from the ship’s crew and coordinate with other agencies involved with the Antarctica mission. The Seattle-based Polar Star is the nation’s only heavy icebreaker still able to operate. But the 43-year-old ship is already well beyond its expected 30-year service life. During annual missions in support of the U.S. Antarctica Program, the Polar Star has been repeatedly plagued by breakdowns and other problems. The Coast Guard, for years, has been seeking to gain congressional funding to replace the Polar Star. 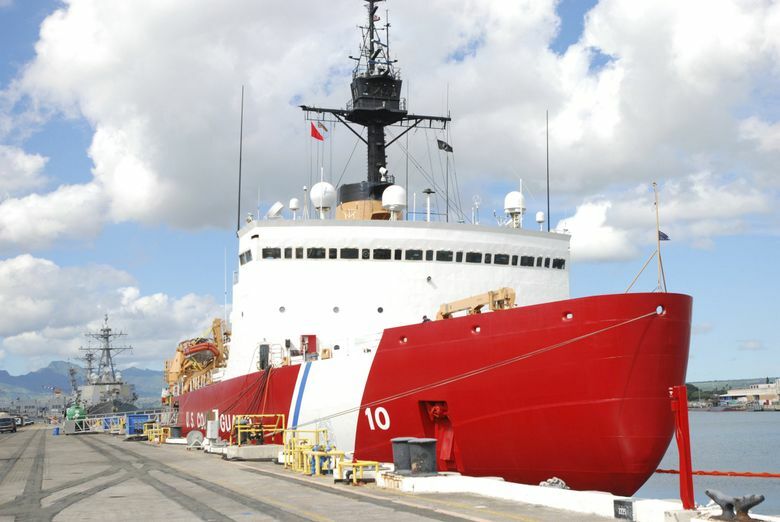 Congressional legislation that passed last month provided $655 million to start construction of a new vessel, and $20 million in planning funds for a second icebreaker that the Coast Guard wants to build. For this most recent cruise, the 150 crew members of the Polar Star departed Seattle on Nov. 27, traveling more than 11,200 miles to Antarctica. The ship broke nearly 17 miles of ice, 6- to 10-feet thick, to open a channel through McMurdo Sound and escorted a container ship through this water to resupply the McMurdo Station, the Amundsen-Scott Pole Station and other U.S. field camps. But the crew also struggled, at times, to keep the vessel fully operational. A leaking shaft that drives a propeller forced a temporary halt to ice-breaking. It was repaired by scuba divers. The ship’s power system went out for nine hours. An electrical problem, before the Feb. 10 fire, caused smoke and damage to a switchboard. “It’s hard to see a ship with which you have a close connection to fall apart, piece by piece, ” said Seattle resident Phil Johnson, who as a Coast Guard reserve officer back in 1976 served as master of ceremonies for the Polar Star commissioning in Seattle. The Polar Star is now en route back to Seattle.